For me, One of the many flavors of fall is lamb souvlaki. Fall is the time to never take your eyes off the mountains as they’re changing color almost daily, time to pull out the warm sweaters for cooler weather, and of course, time for the annural Greek Festival in our city. 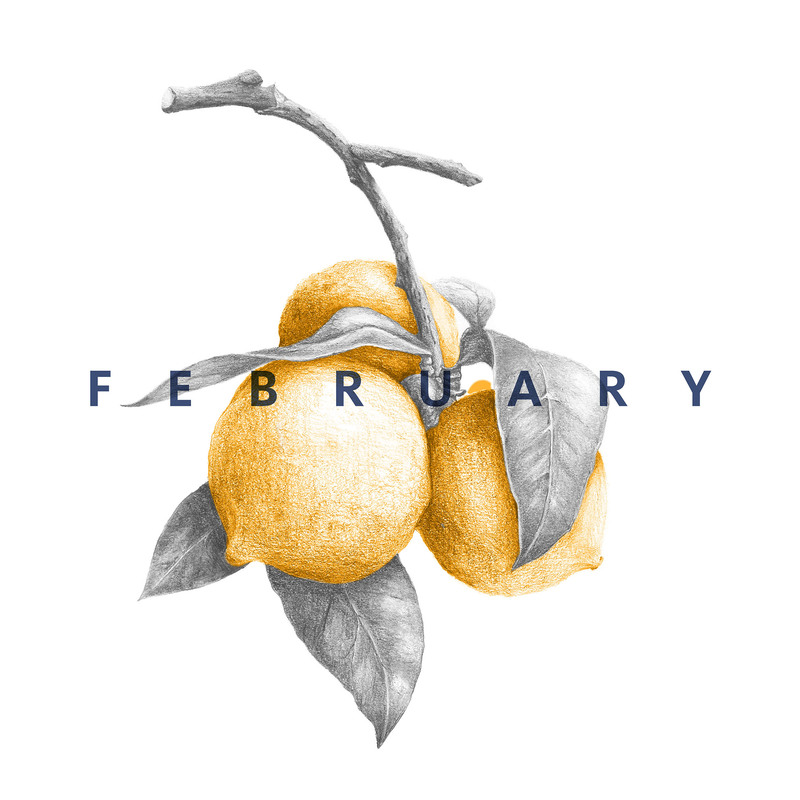 I often remember seasons and special occasions by the foods we enjoy. I fell in love with Greek food many years ago when visiting my sister who was in college in Carolina at the time. She took me to a Greek restaurant and introduced me to the glorious gyro sandwich and convinced me to taste the creamy white sauce loaded with cucumbers, tzatziki (which is now a staple around our house). Since that first taste, I’ve traveled to Greece, had the most juicy lamb gyro on the streets of Athens, and have even made it a yearly tradition to attend our city’s Greek Festival (if not for the fresh feta alone). This year at the Greek Festival I tore a page out of the festival booklet explaining how to make traditional souvlakia, stuck it in my pocket and promised myself that another year wouldn’t go by without me trying to make this at home. As it turns out, lamb souvlakia is crazy easy to make, and now I’m wishing I would have tried it at home years ago. I guess there’s also something to be said for waiting for that special evening to go out to our favorite Greek restaurant in town or looking forward to the foods of the Greek Festival every year, lt knowing now how to make really good Greek lamb is definitely a worthwhile skill and we’ll be taking full advantage of it as we make this dish time and time again. I’m grateful for the generosity of the folks who put on the Greek Festival for sharing their recipe and grateful for delicious local lamb from Snowy Mountain Creamery. You can find the lamb as well as the bulgur at Liberty Heights Fresh. 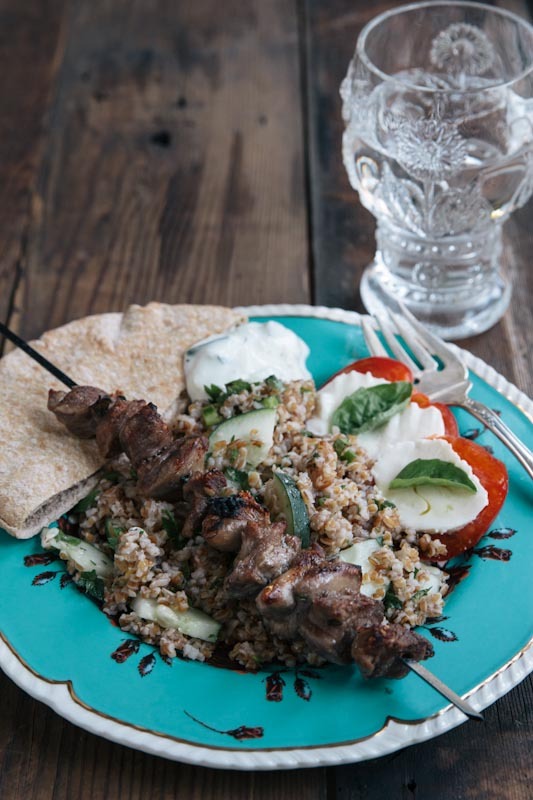 An easy recipe for Lamb Souvlaki that takes less than 10 minutes to cook! Chop the lamb into large 1 inch pieces, then pat dry with a paper towel. Place the lamb in a large ziplock bag with the lemon juice, olive oil, oregano and a little salt. Let the lamb marinate in the refrigerator for 2-4 hours. Turn oven to broil. Stick lamb onto skewers and place the skewers over a rimmed baking sheet to catch any juices from getting on your oven. Broil for about 8 minutes, turning half way through. 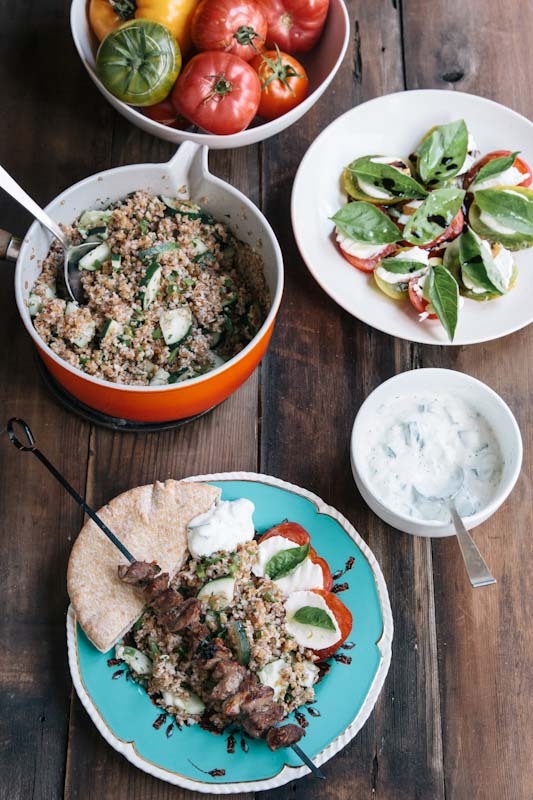 Lamb Souvlaki goes perfectly with this herby lime bulgur salad. We also have a few slices of our homemade whole wheat pita bread with this meal so we can scoop up everything into one bite! Bring 2 cups of water to a boil. Add in 1 cup bulgar then simmer for 15-20 minutes or until all liquid is absorbed. 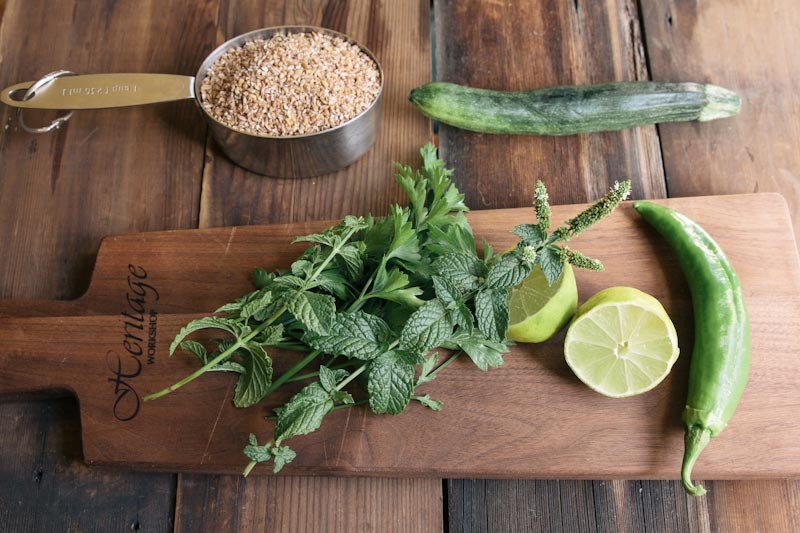 Toss bulgar with 1/2 sliced cucumber, 1/4 cup chopped parsley, 1/4 cup chopped mint, 1/4 cup feta cheese, juice from two limes, and 1/4-1/3 cup olive oil. Salt and pepper to taste. 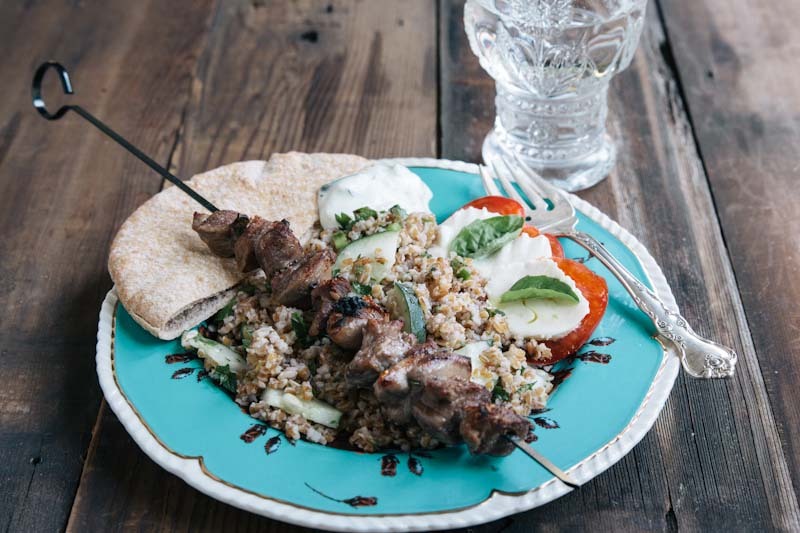 Serve with lamb souvlaki. 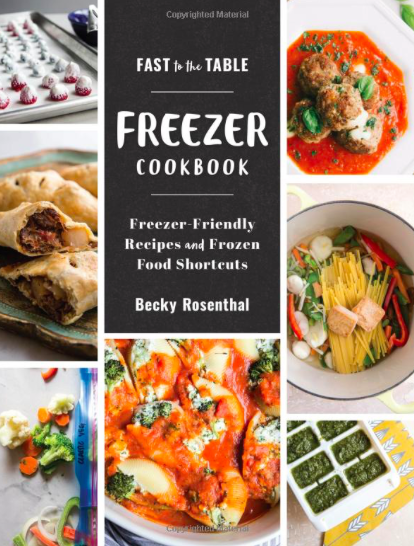 I would absolutely love this for dinner. Lamb is my favorite red meat by far! Lamb is my favorite red meat too!! I think too many people are afraid to cook with it. I’ll have to try lamb souvlaki. Looks like a delicious meal. 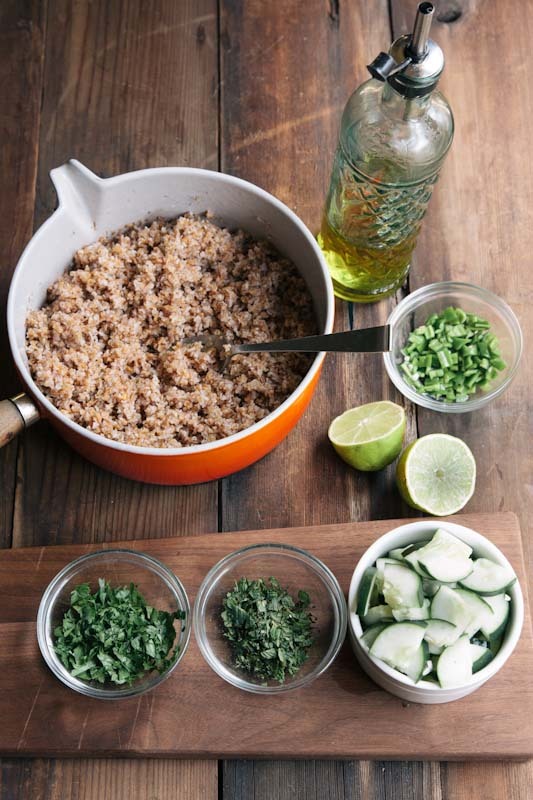 Do you realize it’s bulgur, not Bulgar?